Yesterday, President Obama composed a letter to the Solen High School Boys’ Basketball Team located on Standing Rock Reservation wishing them success in the regional tournament championship game they will play tonight. The letter is the latest outreach the President has made to Native youth and the Lakota. “I have been inspired by the talent and determination I’ve seen in young people across the Standing Rock Sioux Indian Reservation, and I know the same drive has played a part in your success this season,” wrote the Commander in Chief. 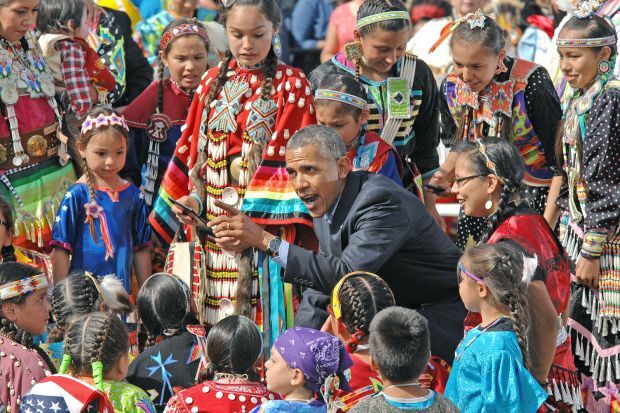 President Obama was touched by the youth he met during his June 2014 visit to Standing Rock. He has since described his talks with the children as eye opening and admitted listening to the difficulties Native youth must endure brought him to tears. “I love these young people. I only spent an hour with them. They feel like my own. And you should be proud of them–because they’ve overcome a lot, but they’re strong and they’re still standing and they’re moving forward,” he said during the visit. The Obama family later received a group of Native youth for a November luncheon in Washington D.C. He remains committed to facilitating progress in Native country, introducing a series of initiatives such as Native Youth Community Projects, Generation Indigenous, and a National Tribal Youth Network at December’s Tribal Nations Conference. “I know throughout history, the United States often didn’t give the nation-to-nation relationship the respect it deserved. So I promised when I ran to be a president who’d change that–a president who honors our sacred trust, and who respects your sovereignty,” the president stated. The Lakota People’s Law Project is encouraged by the latest heartwarming token of respect and takes it as a signal of hope that the leader of the United States remains engaged in Native issues. The Obama administration has also done more than just send letters and give speeches as last week, it released updated ICWA guidelines that take states such as South Dakota to task for trying to circumvent this important law. Eric Holder’s Department of Justice vowed to ramp up its enforcement of ICWA and lately it intervened in a federal case in South Dakota on behalf of two Indian tribes who assert the state of South Dakota continues to ignore Indian rights in child custody cases. While, it is refreshing to see a leader acknowledge Natives so actively, we want to see more than just words as much work remains in the effort to restore the Lakota people — and by extension all indigenous people — to their rich and proud heritage. I’m amazed he took time out of his day. Exactly, wiseoldsnail. Any government of a nation turned corporation has no, but NO actual interest in the wellbeing of any its people, only the interests of it’s corporate holdings and foreign positioning in the ongoing collective manipulation we the people now realize is being used against us. We may want to notice how the letter is only addressed to the collective (the team). It compares a collective (the team) with yet a larger collective (the Standing Rock Sioux Indian Reservation), emphasizing the importance in joining a collective in order to succeed, that as a collective did you, the team, get “this far”. I guess he means wins in a competitive setting. I don’t know. The collectivism jargon has us all shift into collective representation, and although we (want to) believe a human being treats respectfully another human being, we know all too well how a collective disrespectfully mistreat another collective. Especially with the still abusive misevaluating monetary system put upon us to all be used with. Don’t mean to bring down hope, but why continue believing the same old gang of the 1600s, with their colonial mentality, ie. collectivism? I love PRESIDENT Barack Obama.He is the only man of color to serve as our commander in CHIEF. He is work ing 24/7 to improve our country.I wish All Indian people appreciated his sacrifices. Jolene, colour-coding aside, you know that the role of a president of a corporation has less deciding power than that of the CEO, CFO, COO and CTO of such an enterprise, right? Do you understand that there exist CEOs, CFOs, COOs and CTOs of the United States corporation? You know the nation is a corporation, right? No matter the romantic affair people have with a presiding member of a corporate collective claiming to represent the people, the role of president in a corporation is not as glorifying or possibly influential as one may believe it to be or may be eluded by mainstream news to be. I wish Obama and company actually appreciated the sacrifices made by tribal nations since colonialism ensued.